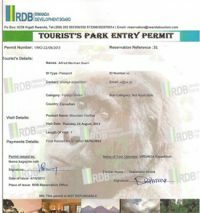 The 14 Days Gorilla Safari Rwanda Wildlife Tour Uganda is a wildlife safari in Uganda and a Rwanda Gorilla Trekking safari Tour tailored to reach you to the prime safari parks of these countries. 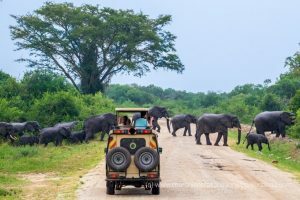 You go for a wildlife encounter to Ziwa Rhino Sanctuary, Murchison Falls National Park, Kibale Forest national Park and Queen Elizabeth National Park in Uganda. 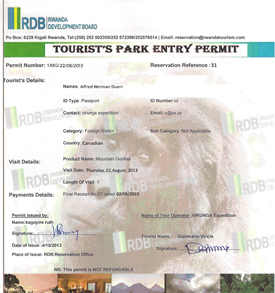 Then after you continue to Volcanoes National Park, Nyungwe Forest National Park and Akagera National Park in Rwanda. Arriving at Entebbe International Airport in Uganda your safari starts with a drive from the airport to a booked hotel in Kampala-Uganda’s capital. The next day you are driven to Murchison Falls National Park with a stop at Ziwa Rhino Sanctuary for rhino tracking. 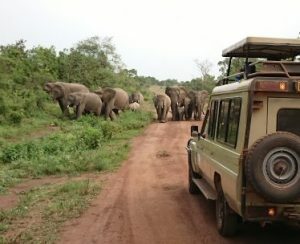 After a game drive, boat cruise and hike to the top of Murchison falls, you then continue to Kibale Forest National Park. After chimpanzee trekking, you continue with the drive to Queen Elizabeth National Park for a game drive and boat cruise then drive to Lake Bunyonyi. 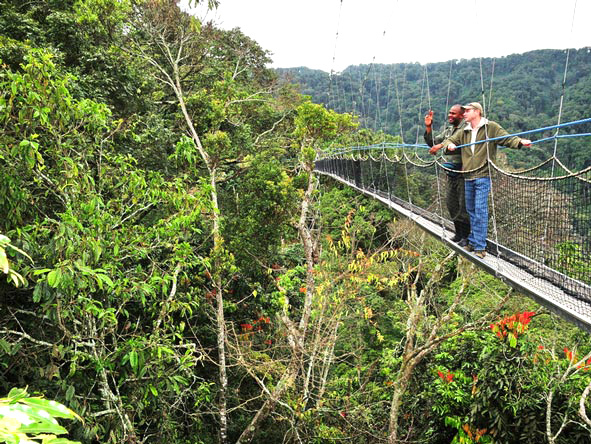 From Lake Bunyonyi you are driven to Rwanda’s Volcanoes national park where you undertake Mountain Gorilla and golden monkey trekking then after continue to Nyungwe Forest National Park for a canopy walk and chimpanzee trekking. You then continue to Akagera National Park for wildlife sightings. You later on depart via Kigali international airport in Rwanda. Day 2: After breakfast, you are driven to Ziwa Rhino Sanctuary for rhino tracking then continue to Murchison Falls National Park. Day 3: You have a morning game drive, an afternoon boat cruise and hike to the top of the falls. 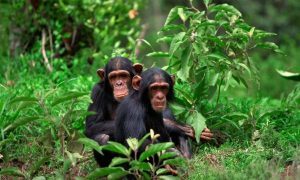 Day 5: In the morning you go chimpanzee trekking then transfer to Queen Elizabeth National Park in the evening. 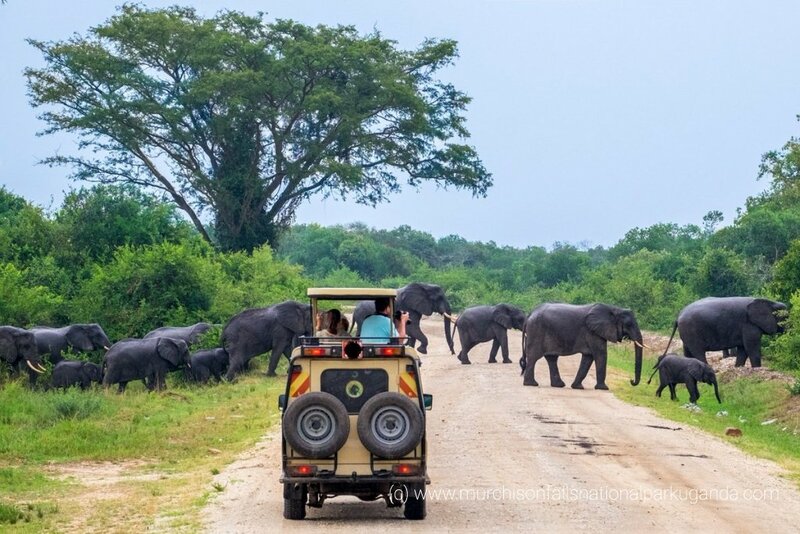 Day 6: You undertake a morning game drive in the Kasenyi sector of Queen Elizabeth then undertake an evening launch trip on the 45km long Kazinga channel that joins lakes Albert and Edward. Day 8: You have relaxed breakfast at the shores of lake Bunyonyi then after transfer to Volcanoes National Park in Rwanda. Day 9: After breakfast, you are driven to Volcanoes National Park where you go gorilla trekking lasting about 2-6hours. 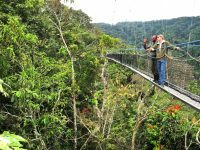 Day 10: This morning, you go for golden monkey trekking then after transfer to Nyungwe Forest National Park. Day 11: You go for chimpanzee trekking in the morning then after undertake an evening canopy walk. 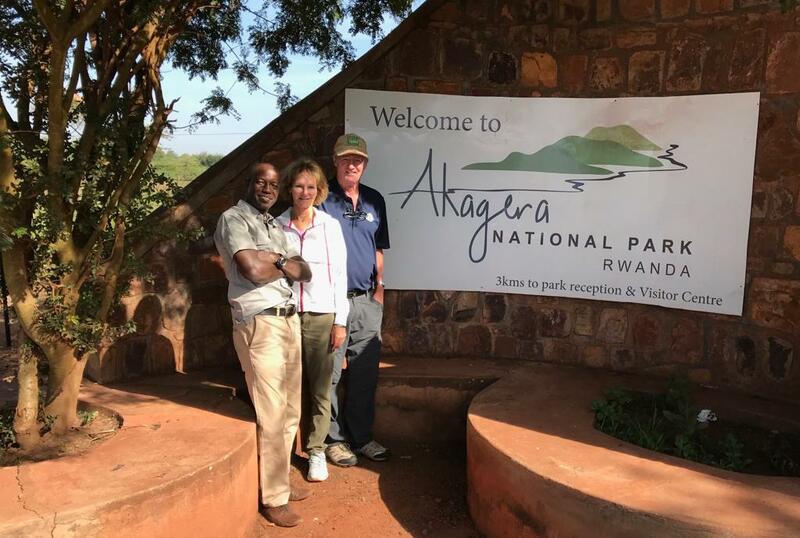 Day 12: From Nyungwe Forest National Park, you are then transferred to Akagera National Park arriving in the evening then relax at a booked lodging facility close to the park. Day 13: You go for a morning game drive at Akagera National Park then undertake an evening boat cruise at lake Ihema. Day 14: After breakfast, you are driven to Kigali international airport for a departure flight via Kigali city. On arrival at Entebbe International Airport (Uganda’s International Airport), you meet and greet with your driver guide who you will find there waiting for you and ensures your transfer from the airport to your next destination. From Entebbe International Airport you are driven to a booked accommodation facility in Kampala-Uganda’s capital where you spend the night and relax from jet lag. In the morning after breakfast at your accommodation facility in Kampala, your Uganda wildlife safari driver guide picks you up for the drive to Ziwa Rhino Sanctuary 169km away on about a 3 hours’ drive on the Kampala-Gulu highway. 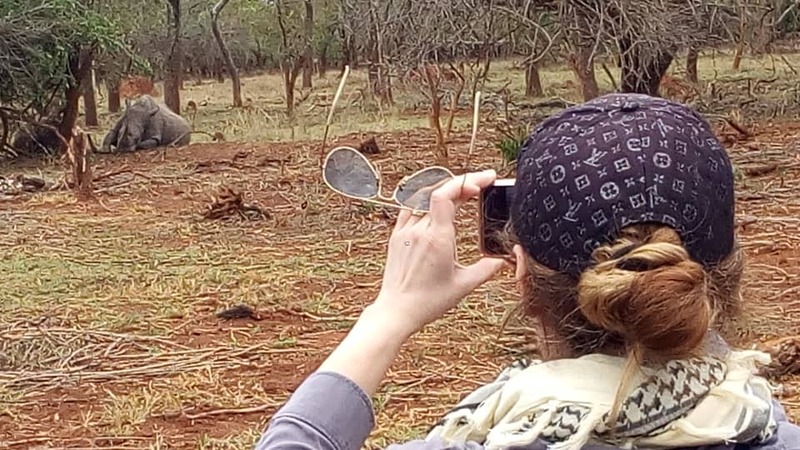 You go Rhino tracking for about 2 hours, you have lunch and continue with the drive to Murchison Falls National Park 134km away on a 2hours 30 minutes’ drive along the Kampala- Gulu highway. Arriving in the evening, you check into an accommodation in Murchison Falls National Park where you relax and spend the night. In the morning you go for a game drive at Murchison Falls park starting at 7:00am within the vast savannah plains of the park. 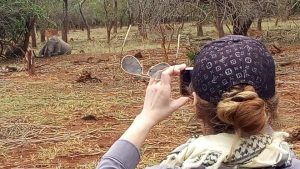 The possible sightings here include elephants, lions, leopards and buffaloes with the game drive lasting about 2-4 hours then after go for lunch or have packed lunch. In the afternoon at 2:00pm, you go for a boat cruise/launch trip to the bottom of the awe-inspiring Murchison falls in search of the numerous schools of hippos, crocodiles and water birds at the bottom of the falls. From the bottom of the falls you start the hike to the top of the magnificent Murchison falls that takes about 40mins to 1hour. You find your driver guide waiting for you at the top of the falls for a drive back to your lodging facility. From Murchison Falls National Park, you have your last breakfast early morning and then embark on a drive to Kibale Forest National Park. You briefly stop at the Ndali Kasenda crater field for scenic views of the crater lakes. They are known as crater lakes because at their time of explosion, they were violent spewing ash and rock. You then continue with the drive arriving for dinner and a night’s stay at an accommodation in Kibale Forest National Park. 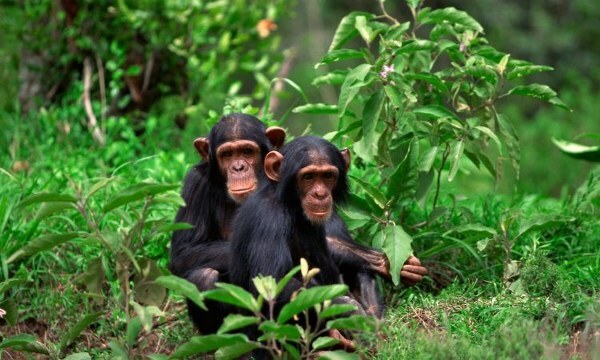 In the morning after breakfast, you go to Kibale Forest Park for chimpanzee trekking. chimpanzee trekking starts at 8:00am lasting 2-5 hours in the jungle though only 1 hour in the presence of the chimpanzees. After watching the chimpanzees at play and taking pictures, you return to the park headquarters where you meet your driver guide. You have lunch and then embark on a transfer to Queen Elizabeth National Park arriving in the evening for check in to an accommodation in Queen Elizabeth National Park. In the morning you after this adventure experience and probably the last Uganda safari activity, you check out then embark on a drive past the Uganda-Rwanda border to Volcanoes National Park in Rwanda. You spend a night at an accommodation close to the national park.